6 months ago we celebrated the last moments of Benedict’s Papacy by tweeting our gratitude with #ThanksPontifex. 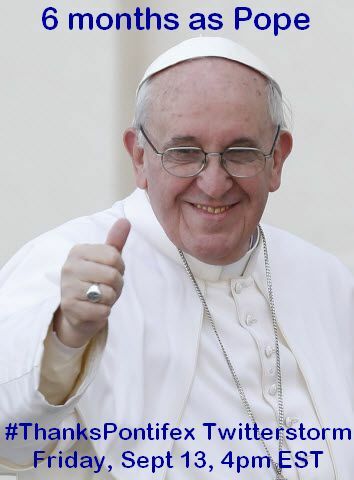 Now we approach Pope Francis’ 6 month anniversary; it’s Friday, September 13th. Discussing it briefly with a few twiends (friends on twitter), I thought doing another twitterstorm of gratitude was in order. Last time we did a twitterstorm with #ITrustinU for the feast of the Sacred Heart, we got 7,760 mentions in an hour and trended #3 in the USA (so lots of people heard about it). I think we can beat that and get 12,000 and trending #2 this time. For the non-geeks, trending is an algorithm based on the number of mentions, the velocity (newness and growth rate), and who is mentioning it. If we all tweet together, we’ll get #ThanksPontifex treading and thus tell the world the gratitude we have to Pope Francis. I think 4pm Eastern (New York, Toronto) would be a good time. For those of you elsewhere that’s 9pm in London, 3pm in Chicago or Mexico City (Central), 2pm in Denver or Calgary (Mountain), and 1pm in Los Angeles or Vancouver (Pacific). We’ll try to keep the tweets going for at least an hour. Search #ThanksPontifex (or just click on it) at 4pm and Retweet some tweets from there (this helps get the word out and will help it trend. I want to thank you in advance for joining us. Please add your proposed tweets in the comments.